We had some special family members visiting our house last week- my (chef) nephew, his wife and their adorable 22-month-old daughter. I love having people staying with us because that gives me an opportunity to think up a delicious menu, pop open the good wine, and eat in our rarely-touched-but-much-loved dining room! My nephew cooks a LOT when he’s working on the Idaho Ranch where he plans all of the menus and food that his ranch guests eat, so I wanted him to relax and enjoy some home-cooked meals. Lasagna seemed like the perfect comfort-food meal for us all. 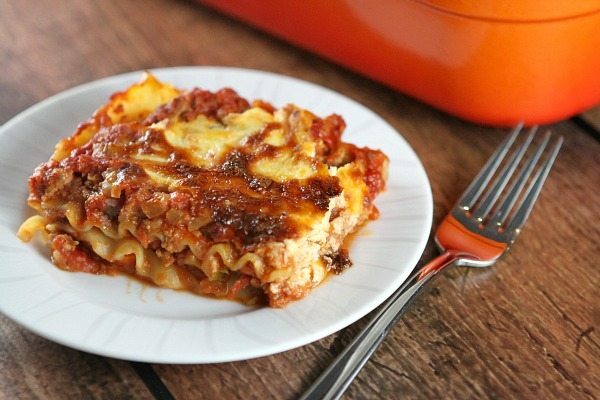 A light lasagna was an even better choice! The recipe comes from David Joachim’s book: Global Kitchen: The World’s Most Delicious Food Made Easy (a collaboration with Cooking Light). I first met David last year in Las Vegas when we were judging the Pillsbury Bake Off together. I came to learn that he’s an extremely talented recipe developer who has written dozens of cookbooks. In fact, Global Kitchen is his 40th cookbook. I can’t imagine writing that many cookbooks, but he’s a talented guy who knows how to do this! 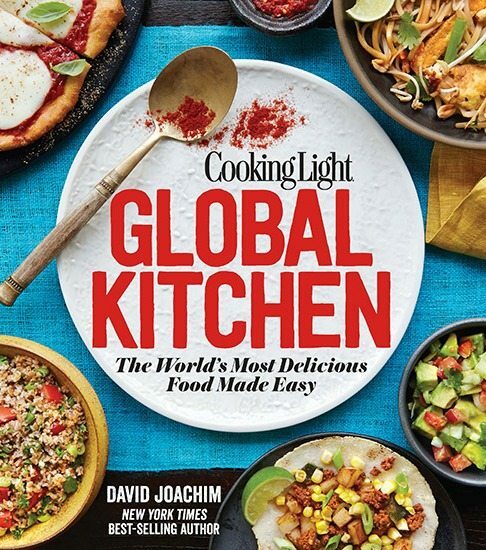 Joachim consulted food experts for this book, and it includes recipes from around the globe. I’m personally enjoying it because it’s pushing me out of my day-to-day comfort zone and into trying out some international dishes for a change. You’ll find things like Steamed Pork Buns and Tandoori Grilled Chicken (East Asia and India), Chicken-Coconut Soup and Lamingtons (Southeast Asia and Australia), Baba Ghanoush and Cape Malay Curry (The Middle East and Africa), Apple Strudel and Ukrainian Borschch (Europe and Eurasia), Argentinean Pork and Dulce de Leche Flan (South America), and Huevos Rancheros and Pulled Pork Barbecue Sandwiches (North and Central America). There are so many interesting dishes shared in this book, and there are big beautiful photographs of them all too. Every recipe includes nutritional information. It’s a good one to have on your cookbook shelf. This light lasagna begins with a homemade sauce that utilized vegetables, ground turkey (I used 93% lean) and a little bit of pancetta.. I loved the sauce so much that I will be making it again all by itself to have with other pasta! 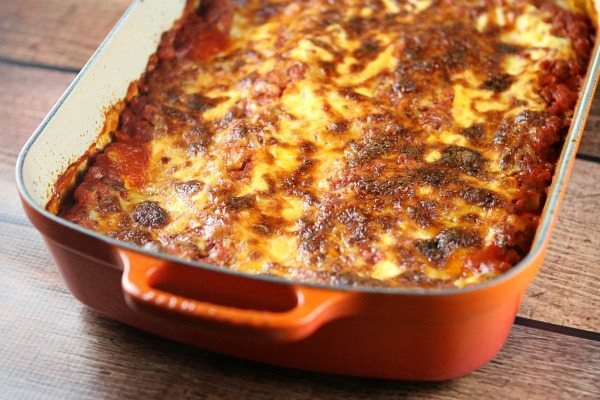 The lasagna is layered with a simple ricotta/mozzarella/egg mixture, the sauce and cooked noodles, and then it’s baked for just 35 minutes. It turned out SO good. I’m pretty sure it was the sauce that put it over the top. Everything about it said “This is a really good homemade lasagna!” And nothing about it said, “This totally tastes like a lighter lasagna.” It was perfect in every way. I believe even my fancy schmancy chef nephew and his wife were happy with it too. Their 22-month old had it for lunch the next day and was gobbling it up! 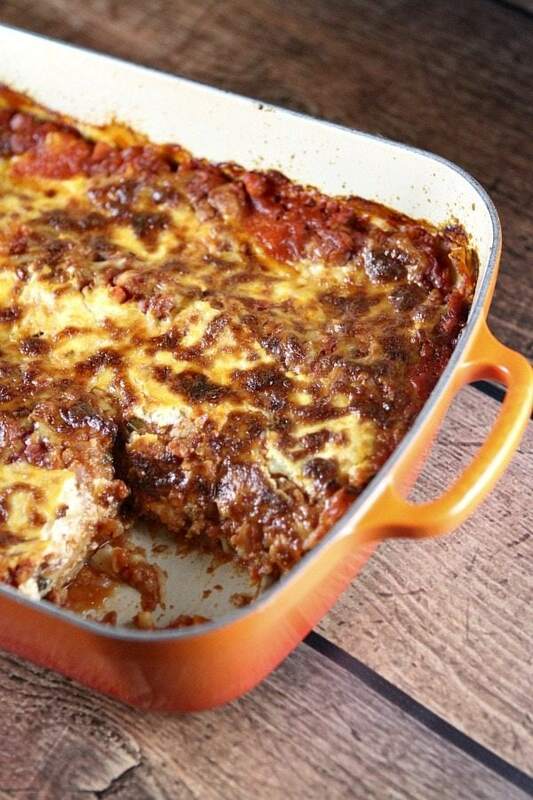 Sometimes the simplest comfort food is the best choice for guests! Prepare the sauce: Place onion, celery, carrot and garlic in a food processor; pulse until coarsely ground. Heat a medium saucepan over medium-high heat. Add oil to the pan; swirl to coat. Add tomato paste and pancetta; cook 1 minute, stirring constantly. Add turkey, and cook 4 minutes, stirring to crumble. Add wine; cook 2 minutes or until liquid evaporates, scraping pan to loosen browned bits. Add onion mixture, salt, red pepper, oregano and black pepper to the pan, and cook 3 minutes, stirring occasionally. Add milk and basil; cook 3 minutes, stirring occasionally. Stir in tomatoes; reduce heat, and simmer 20 minutes. Preheat oven to 425 degrees F. Spray a 13x9-inch glass or ceramic baking dish with nonstick spray. Prepare the filling: In a medium bowl, combine the ricotta, mozzarella and egg. 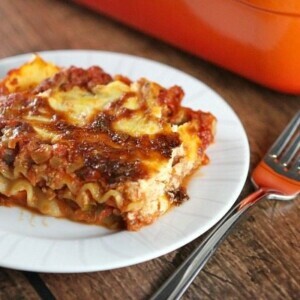 Assemble the lasagna: Spread 3/4 cup of the sauce in the bottom of the prepared dish. Arrange 3 noodles over the sauce; top with half of the remaining sauce and half of the ricotta mixture (I spooned it on and gently spread it over the noodles). Repeat layers once, ending with the ricotta mixture. Sprinkle remaining 1/2 cup mozzarella evenly over the top. Bake for 35 minutes. If your cheese is not golden brown already, you can preheat the broiler and broil the lasagna for 2 minutes (mine was already toasted, so I skipped this step). Let stand for 10 minutes before serving.